NFL rival and teammate Eric Weddle strongly endorses Smith’s candidacy. 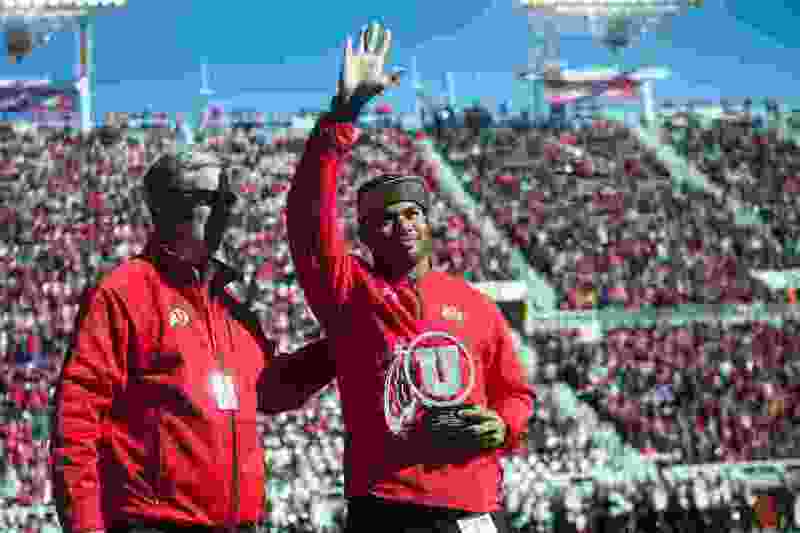 (Chris Detrick | The Salt Lake Tribune file photo) Crimson Club Hall of Fame member Steve Smith Sr. is honored by then-Utah athletic director Chris Hill during a 2017 game at Rice-Eccles Stadium. Having teamed with his wife to finance athletic and academic scholarships at the University of Utah, Steve Smith Sr. enjoys receiving letters of thanks from students each year. In 2022 or some year afterward, Smith hopes to receive a phone call that would be meaningful to him in a different way. The former receiver is in line to become the second Ute player inducted into the Pro Football Hall of Fame. Smith this month joined the Pac-12 Hall of Honor, in an annual ceremony that recognizes an athlete from each school — in Utah’s case, usually predating Pac-12 membership. He’s also the featured speaker in Saturday’s Utah Football Coaches Clinic. Smith views his Hall of Fame candidacy in the same context as his failed attempt to win a Super Bowl during his 16-year NFL tenure with Carolina and Baltimore: It is not necessary to complete a satisfying career, but it would be nice. Larry Wilson, a St. Louis Cardinals defensive back from 1960-72, is the only ex-Ute enshrined in Canton, Ohio. Smith’s Hall of Fame eligibility begins in 2022, five years after his retirement. Statistically, with Smith having caught 1,031 passes for 14,731 yards and 81 touchdowns, Pro Football Reference ranks him comparably to Hall of Fame receivers Andre Reed, James Lofton, Cris Carter and Art Monk. His numbers are somewhat inflated by this century’s passing emphasis. Some observers have suggested that voters will scrutinize Smith’s demonstrative nature on the field as well as some off-field issues early in his career. With only five modern-era players inducted each year, receivers recently have had to wait for induction beyond the initial five-year mark. Former Ute safety Eric Weddle respected Smith as a longtime opponent and appreciated him even more as a teammate in Baltimore in 2016, Smith's farewell season. The receiver and return specialist was drafted by Carolina in the third round in 2001. He became a star almost immediately, helping Carolina reach the Super Bowl in his third season and catching four passes for 80 yards vs. New England — only to have a young Tom Brady lead the Patriots’ drive to the winning field goal.